Why do I blog this? preparing a presentation about failed futures, including some elements about the problems caused by “automation”. The author of the paper argues that the shift from what to how/why lead computing researcher to a situation where they really have to pay attention to “ the needs, wants, hopes, expectations, wishes, fears, concerns, and anxieties that people have regarding technology“. Un petit insert du blog de Nicolas Nova qui pose la (bonne) question: les "choses" doivent-elles être automatisées, si oui comment et pour faire quoi? L'automatisation (la "domotique" en architecture) est aujourd'hui une activité par défaut où l'on automatise simplement des comportement fonctionnels du bâtiment, sans se poser la question du pourquoi. Mais surtout, sans se poser la question de ce que pourrait produire une telle approche en terme de formes & fonctions architecturales. En quoi cela pourrait transformer le bâtiment. 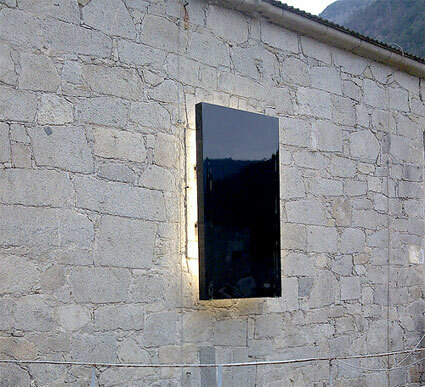 Siegrun Appelt's light installation 64 kW for the German contribution to the 11th International Architecture Exhibition of La Biennale di Venezia serves as a visual exclamation point for a more conscious handling of energy resources. 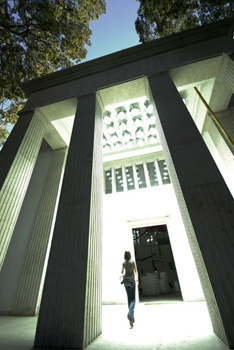 The installation, located in the entrance to the German Pavilion in Venice, shines with four times the intensity of the sun on a cloudless day. The shining light and the heat it generates make traversing the installation a truly physical experience; exhibition visitors can live the connection between energy use and waste. During the running time of the exhibition from September 14 until November 23, the 32 spotlights will use more than 50.000 kW. The work calls on visitors to save energy and then symbolically donate that energy to the 64 kW Negawatt Power Plant. The plant was inspired by Amory Lovins' term negawatt, which the physicist introduced as a unit for measuring saved energy. The first energy donator for the 64 kW Negawatt Power Plant is the city of Berlin. The illumination at the Brandenburg Gate will be turned on and off over the course of several days according to a choreography designed by Appelt herself. This light-update of Berlin's most prominent emblem will serve as a prime example of the fact that saving energy needn't only mean abnegation, but also the creation of a surplus. Though such large-scale energy donations are greatly appreciated, the work is particularly intended as a platform for voluntary energy savings in everyday life. Anyone can take part by making an individual donation, be it replacing an old light bulb with an energy-saving one, riding a bike to work or performing any other energy-saving act. Individual energy-saving ideas will be collected in the Negawatt Power Plant. One can donate to the plant directly at the exhibition in Venice or via the internet portal Utopia.de. At www.utopia.de/negawatt/64kw, users from around the world can donate individually saved energy and thereby participate in a forum for everyday, visionary and extraordinary energy saving. That way, the 64 kW Negawatt Power Plant will become an idea pool for a more conscious handling of resources. The plant can be seen as an experiment: will the 64 kW installation be executed in a climate neutral manner? How willing are people to make individual energy sacrifices? What new ideas for energy saving will emerge out of the Negawatt Power Plant? 64 kW is presented as part of the German contribution „Updating Germany. Projects for a better future" at the 11th International Architecture Exhibition of La Biennale di Venezia. General commissioners Friedrich von Borries and Matthias Böttger of raumtaktik are presenting 20 projects from architects, designers, engineers and artists – steps both large and small toward a better future. The exhibit is supported by Germany's Federal Ministry of Transport, Building and Urban Affairs. Vu à Venise lors de la biennale, les 64kW de l'installation chauffent en effet assez fort, plus que PTS car le rayonnement est permament et concentré sur un point. Cela est évidemment aussi à mettre en parralèle avec l'installation d'Olafur Eliasson dans le hall des turbines de la Tate Modern à Londres (Weather Project). Le pavillon allemand de la biennale traite quant à lui de question de "sustainability". Last year at the Centre Pompidou in Paris, Philippe Rahm's installation Diurnisme was introducing the night during the day as a perverted answer to the perpetual daytime created by the modern lightening, internet and globalization. The room was bathed in a very bright orange/yellow light that triggered the production of melatonin which regulates our perception of day and night, fooling the body into thinking that it is nighttime. Rahm is an architect of the invisible and physiological aspects of space. One of his earlier projects, Hormonorium, featured an alpine-like climate, complete with the brighter light and shorter supply of oxygen you get at high altitudes. Made of 528 fluorescent tubes, the floor emitted a white light that reproduces the solar spectrum. The very bright light stimulates the retina, which transmits information to the pineal gland that causes a decrease in melatonin secretion. Visitors were thus supposed to experience a decrease in fatigue, a probable increase in sexual desire, and regulation of moods. Besides, the oxygen-rarefied space caused a slight euphoria due to endorphin production. 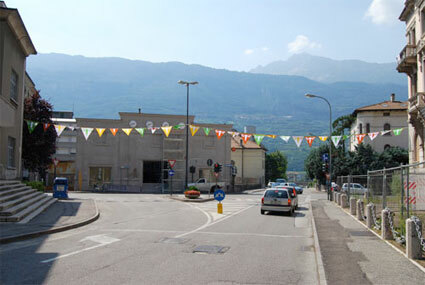 The first project was exhibited in the Scenarios exhibition at Fortezza, near Bolzano. That's actually the only show i didn't visit (but if you read italian, i'll recommend you the report that SounDesign wrote of the show). 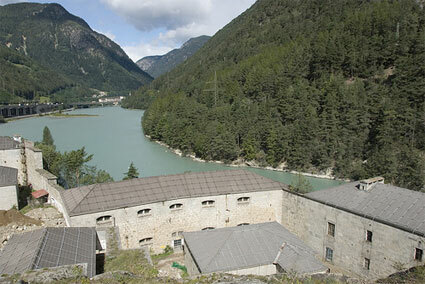 Fortezza was built in the 1830s by the Habsburgian Empire in order to defend the north/south passage through the Dolomite mountain region from two sides. For the biennale, the fortress is hosting projects which are mostly immaterial: voice recordings, text, light and landscape. Rahm placed black-backed lightboxes over the outside of some of the fortress windows. This light installation, named Climate Uchronia, refers to how our perception of natural and artificial ambient conditions are subtly influenced by factors such as climate change. Rahm's purpose is to re-create, inside a room, the climate and exact daylight that the city of Bolzano would experience in the absence of global warming. 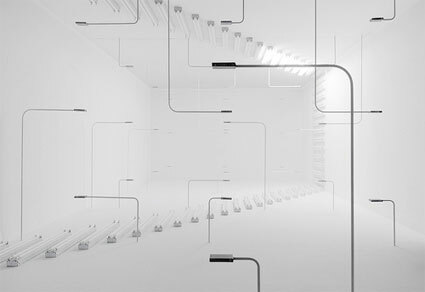 The installation demonstrates how today, you can still obtain a 'natural' climate but only through artificial means. The concept is not as 'crazy-arty' as some might believe. In the UK, the Royal Society is about to launch a study aimed at reviewing the possibility of saving the planet by "geoengineering" the climate on the grandest scales imaginable. Based on an Atmospheric Chemistry Model that sets out to remove the effects of greenhouse gases since 1850, a computer generates the uchronian climate of Rahm's installation for each minute of the duration of the biennale. The software calculates the variation of light intensity depending of the variation of the relative humidity in the air. With Climate Uchronia, the architect offers visitors the possibility to inhabit for just a moment a world that we will never know. 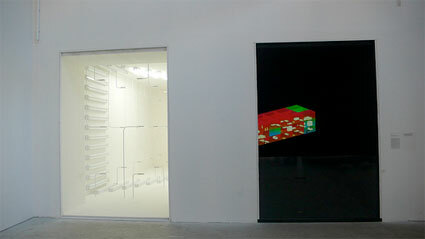 The second work, Météorologie d'intérieur / Interior Weather, 2007, was exhibited in Rovereto, once again in a post-industrial sites (the Ex-Peterlini cocoa factory). 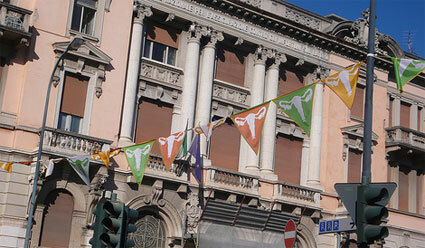 I forgot to take a picture of the outside of the exhibition space as i was too busy admiring the glorious Uterus Flags that graced the street right in front of the Ex-Peterlini. 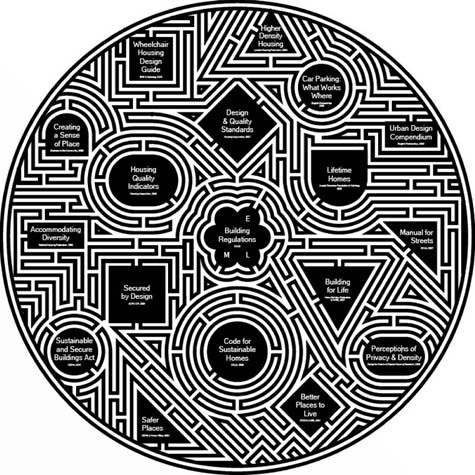 Interior Weather is conceived as two spaces, one white gallery whre an abstract "interior weather" condition is produced, and the other black space, where the resultant data is interpreted. In a brightly lit and enclosed room, sensors measure variations in light, humidity and temperature; the space is analyzed as a micro-geography in constant flux. The results of these measurements are sent to the adjacent gallery where they are visualized as images and stories. Unlike what happened in the first gallery, stern sensors are not guiding the communication of the data. Instead, the information is freely reinterpreted in "fictional scenarios" written by French writer Alain Robbe-Grillet and visualized with a projection in the black room. The installation suggests how the infinite combination of light, humidity and temperature parameters have the potential to generate new spatial practices and social behaviours, and in turn, new architectural forms. In opposition to previous architectural theories (namely the Form follows function position vs the Function follows form one), function and form emerge here as a spontaneous response to climate. The possible use of space is dictated only by the chance confluence of climatic parameters, suggesting new spatial practices, new forms of social behavior and new urban and architectural forms. [Image: Le Corbusier's Maison Citrohan undergoes speculative regulatory alterations, as applied by Finn Williams and David Knight]. 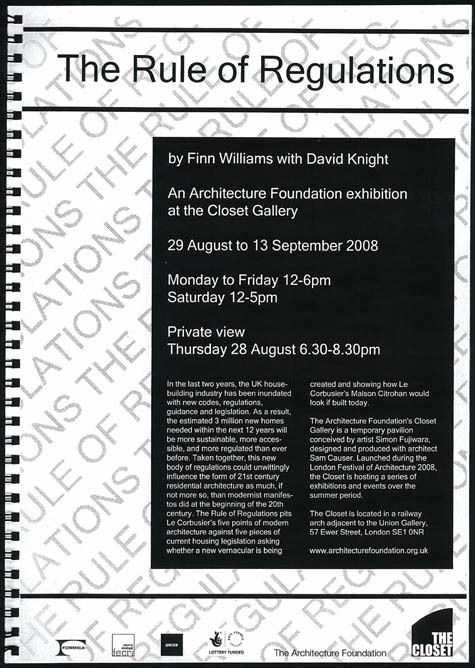 An interesting architectural exhibition, put togther by Finn Williams and David Knight, closed today in London. Called The Rule of Regulations, it looked at what effect today's building codes and zoning regulations might have if retroactively applied to an historic structure such as Le Corbusier's Maison Citrohan. As the Architect's Journal described the show's more wide-ranging spatial implications, "perhaps we can seek out creative opportunities within the current legislative framework, maybe to arrive in a wonderland where new forms of architecture emerge." In The Rule of Regulations, Williams and Knight pit architectural conceits – here Le Corbusier's five points of Modern architecture – against five pieces of current housing legislation. 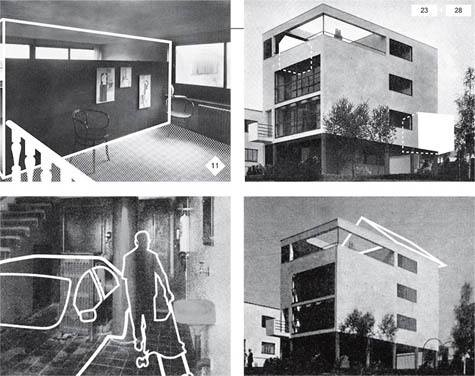 They have remodeled Corb's early mass-housing prototype, the single-family dwelling Maison Citrohan (1922), to see how it might look in today's climate of environmental paranoia, lowest cost, equal opportunities and accessibility. 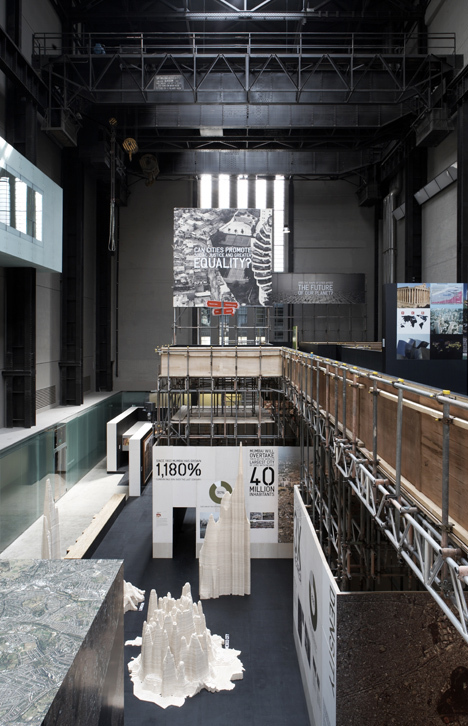 The phrase "environmental paranoia" seems unnecessarily dismissive of very realistic – and reasonable – energy-performance criteria for the construction, maintenance, and use of buildings in the 21st century, but this excerpt still offers us a glimpse of what was at stake in the exhibition's premise. Semi-absurd thought experiments might ensue: What would the Taj Mahal, or Angkor Wat, look like if subjected to Manhattan's 1916 Zoning Law, as so thoroughly explored by Rem Koolhaas? Or how might the city of London be different if subject, overnight and without warning, to the urban regulations of Los Angeles, Dubai, or Beijing? Perhaps cities could even set aside small test-plots, urban labs in which gardens of architectural form can grow. 10 square blocks of west Los Angeles are re-zoned as if they're part of Paris; when new laws are passed in Paris, they go into force there, too. Perhaps you could even assign building regulations from different cities to specific rooms in a single Manhattan high-rise; there's a London room, a New York room, a Moscow room. The whole thing a test structure or legal demonstration project. Architects and architectural students alike come through for tours of the rooms to see what effects, both large and small, a simple change in the rules can generate. I'm reminded of Michael Sorkin's book Local Code, in which an entire city is described and presented – without the use of a single image – through the droll recitation of absurdly specific building regulations. Global Cities addresses the major issues facing today’s cities – size, speed, form, density and diversity. 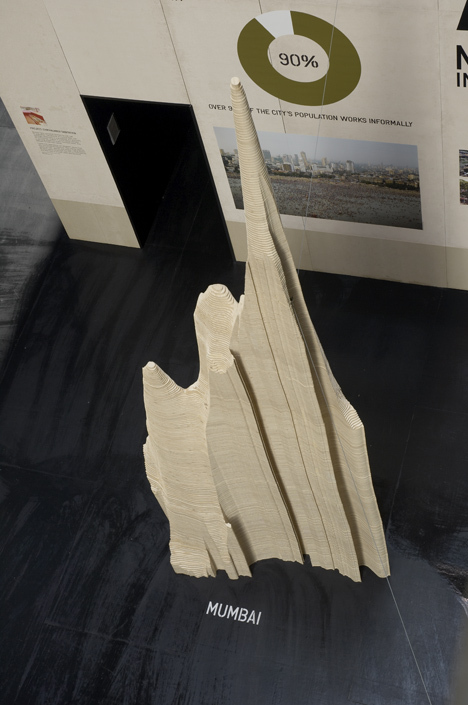 It evolved out of a previous exhibition included in last year’s Architecture Biennale in Venice. 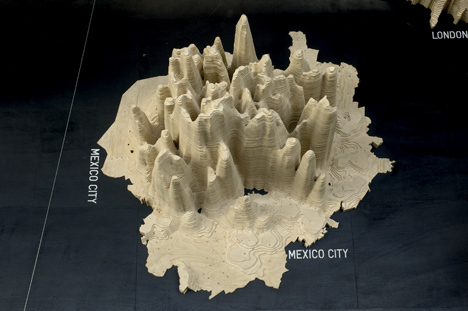 The density models first made their appearance there, where styrofoam forms ingeniously represented the populations of 12 of the world’s major urban centres. For the Tate show, only four models were made, representing the populations of Greater London, Cairo, Mexico City and Mumbai, allowing a more sophisticated model to be developed. Turbine Hall, is constructed using scaffolding and was installed in just 18 days. Photograph: Ed Reeve. 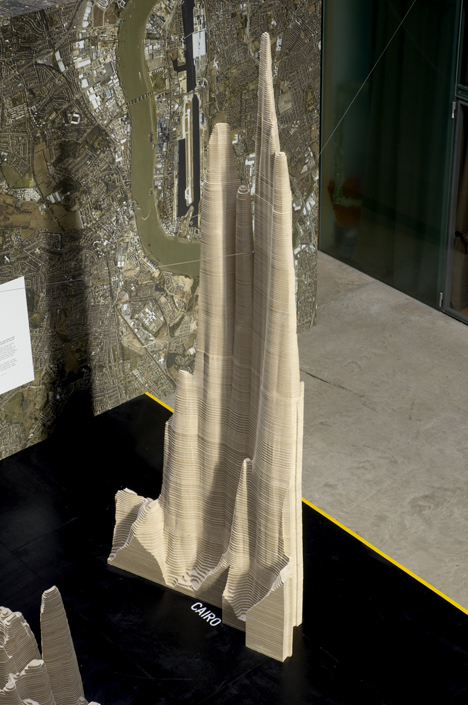 As it was only possible to include four density models in the exhibition, cities showing the extremes were chosen. 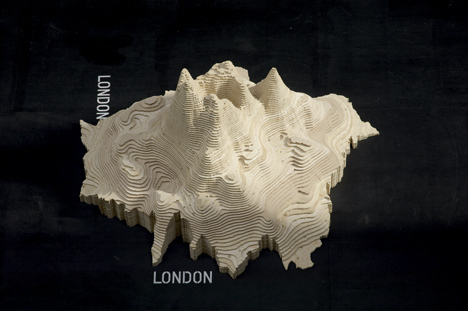 The results graphically show that Londoners have nothing to complain about compared to the residents of Cairo or Mumbai, with the models for these two cities towering over the others, revealing the vast quantities of people that are crammed into a far smaller geographical space. 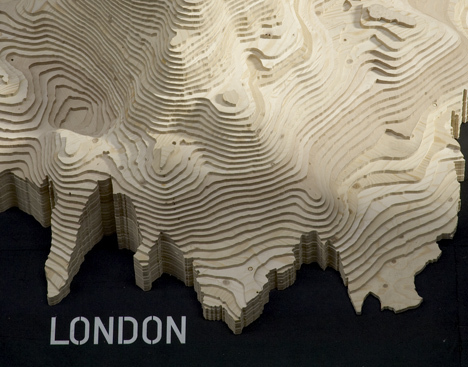 Global Cities was on show at the Tate Modern until 27 August 2007.